Cataract is the loss of transparency of the lens, i.e. the appearance of opacity or turbidity. The lens is located in the center of the eye behind the iris. This lens has a diopter power which is replaced with placement of an intraocular lens. Its function is to focus on objects as we approach them. Light passes through the lens and its rays are focused by convergence in the retina to see clearly. If opacities appear natural light does not penetrate sharply or does so in an aberrant manner. Why is a cataract developed? They can occur at any age of life, even at birth, which is known as congenital cataracts. They more often involve patients of advanced age. Several causes have been documented, including solar radiation, diet, or genetic malformations. Its incidence is very high considering that if the entire population reached 100 years of age, 100% would have cataracts. The age of onset is variable, about 60-70 years. Symptoms include blurred vision, like a fog, poor vision from far and near distances, as if we looked through a cloudy glass. Colour perception can change seeing more yellow. Patients cannot read or watch TV clearly. A cataract can be painless, or have an itchy, pricking or squeezing sensation. What is the best time for surgery? Formerly we waited for the cataract to be "mature". Currently it is considered more appropriate to not wait for it to become too advanced. With modern surgical techniques, the risk of complications is minimal. Today we prefer to operate at an early stage. The diagnosis of cataract must be done by an ophthalmologist. It is performed in the office through evaluation of visual acuity and examination of the eye using slit lamp. This is a device that magnifies ophthalmologic examination. As part of the evaluation prior to surgery your eye doctor will dilate the pupil to evaluate the fundus and adequate pupillary dilation. The only current treatment for cataracts is surgery. Alternative treatments with lack of scientific evidence have been proposed to cure cataracts. Phacoemulsification: it is the most modern and used in 98% of cases. We access the interior of the eye through incisions less than 3 mm. Extracapsular surgery: this was the method used prior to phacoemulsification. 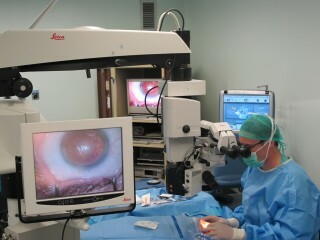 In it we have to open the eye through a 10-12mm incision. It is still used in cases where we can not perform phacoemulsification or if complications arise during it. Intracapsular surgery: no longer used. In this technique we had to open the cornea 12 mm and was extracted the lens and its capsule simultaneously. Is laser the same as phacoemulsification? Phacoemulsification is a technology that has nothing to do with laser. It is based on ultrasonic energy is that causes the phacoemulsifier blade to vibrate. Phacoemulsification etymologically means crystalline emulsion. The ultrasonic frequency at which the small blade vibrates introduce a phenomenon of cavitation and emulsification, which breaks the lens into small particles, thereby facilitating aspiration. 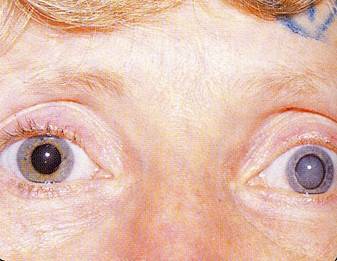 It is necessary to dilate the pupil prior to surgery. Anesthetics are applied as eye drops and the ocular surface is washed with a solution of povidone iodine. Surgery should always be done with special microscopes. The incision is made in the cornea and its size is less than 3 mm. A tiny incision is also performed approximately 45 degrees from the aforementioned one. We introduce viscoelastic substances that give volume, tension and transparency to the media. We then draw a portion of the sac in which envelops the lens: capsulorhexis. The lens is released through the bag with serum infusion and then the phacoemulsifier terminal is inserted. This process produces a small noise frequency (ultrasonic) to the vibrating blade fragment responsible for the lens. The patient in most cases feels nothing. Sometimes you may notice pressure or momentary loss of vision. Surgery is performed with continuous infusion of serum so the patient may notice that it wets the eye and eventually the face. Do not worry as this is normal. Once the cataract has been fully extracted we introduce the intraocular lens. This intraocular lens has an adequate dioptric power, previously measured with biometer. The folded lens is inserted through the same incision. It is placed in the capsular bag. It has "legs" or supports that have to be fixed and focused. Finally viscoelastic remains are removed and an antibiotic is introduced, ending surgery. It does not usually require suturing but sometimes a suture can be placed to ensure hermetic closure of the anterior chamber. Who is a good candidate for phacoemulsification? 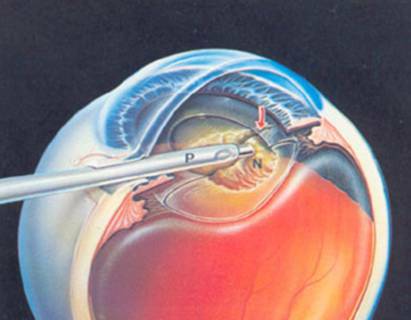 Currently all cataracts are susceptible to be operated by this method. But there are special situations, such as very elderly patients or a very hard cataract associated with corneal diseases, where it is more advantageous to use the old method of extracapsular surgery. This is because the energy released by the phacoemulsifier in cataract could damage a somewhat impaired cornea. Your eye doctor will tell you what is the most appropriate in your case. 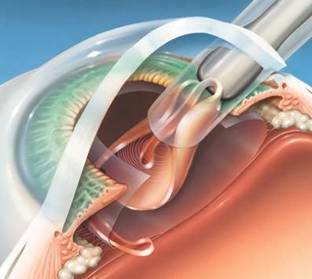 Cataract surgery is usually a safe procedure. But like all surgery, it is subject to human variability. The risk of major complications is very low, less than 1%. Associated with cataract surgery complications and side effects exist. Photophobia: discomfort with light. It is very common. Currently special lenses with ultraviolet filters have reduced its incidence. Tearing: Very common and transient in most cases. Irritation: can exist in the early days. It is transient. Refractive changes: they should be assessed a month after surgery. In most cases patients will only need glasses for near distances. Patients in which bifocal lenses have been used may not need them. Loss of near vision: after the surgery has taken place, accommodation, wich is the ability to focus on close objects, disappears. This ability is lost naturally after age 40 (presbyopia), so in cataract surgery patients the decline is not significant, and is corrected with glasses for near distances (in the event of monofocal lenses). Corneal edema: this often occurs in the early days. Very unlikely to persist over time. It is treated with ointments and eye drops. Posterior capsular opacity: affects approximately 20% of patients. Is a clouding of the capsule that surrounds the region where the intraocular lens is placed. Treatment consists of breaking the capsule in the center by use of a YAG laser beam. This procedure is on average performed 6 months after surgery. It is a simple and practical procedure which is performed in an outpatient setting, after instillation of anesthetic eye drops. Treatment lasts 3-5 minutes. Recovery of vision is instantaneous. 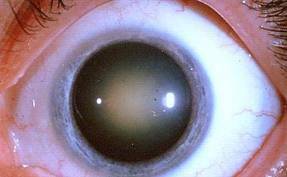 Capsular rupture with fall to the bottom of the eye of lens remains: in these cases it is necessary to undergo further surgery to salvage the remains. 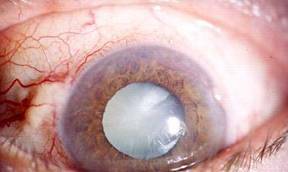 Inability to place the lens in the bag: for various reasons, such as capsular rupture, it is sometimes impossible to hold the lens in place and is expected to move well above the placement sack or front of the iris. Infections: endophthalmitis. It is the most serious complication involving vision loss. Your risk, with current technology and use of antibiotics, is very low, less than 0.02%. What type of lens will I have? Monofocal lenses: single vision lenses which correct vision for far distances, so the patient has to wear glasses for short and intermediate distances. There are monofocal lenses that incorporate the patient's astigmatism but he still must continue to use short distance glasses. Bifocals: Lenses that attempt to correct two distances at once, far and near, and far and intermediate distances. Focus distance and intermediate distance: approximately 60 cm focus and far distance. Focus far and near distance: focus distances, such as reading or sewing, and far distances. These lenses do not correct astigmatism, so if the patient wants to treat this condition, he must undergo laser surgery after a few months, or during surgery incisions must be made in an attempt to correct this. Loss of contrast in low light environments. Vision, halos that are usually usually transient. Your eye doctor will help you choose the best lens to better solve your problem with the least number of complications. Is the surgery painful? What type of anesthesia is used? Cataract surgery is not painful. Either way there is always an anesthesiologist in the operating room that can sedate the patient to calm his anxiety. Topical anesthesia: it is the most frequently used type. Eye props. are applied several minutes before surgery. Retrobulbar anesthesia: This type of anesthesia is used occasionally in more complicated cases such as sunken eyes or uncooperative patients. It is practiced by injecting the anesthetic behind the eyeball. General anesthesia: Used in children and patients who cannot collaborate at all. Why can't I have surgery in both eyes at once? Although the risk of infection is very low, you should always keep this in mind. To avoid a possible bilateral infection we operate one eye and wait at least a week to do it in the other eye. How long does it take to do the surgery? The operating time is very short, 10-20 minutes. Preparation for surgery. What tests do I need? Usually an electrocardiogram, and a basic analytical clotting times, if anesthesia is topical. The day of surgery you should take your usual medication, showering, no makeup and 6 hours fasting. No metal objects or be of value. The patient must sign an informed consent. A crucial test is biometrics. This test is perfomed in the office prior to surgery. The objective is to calculate by ultrasound, the size of the eye and calculate with mathematical formulations designed for this purpose, the dioptric power of the intraocular lens implant which will be needed. It is practiced with topical anesthetics, because we have to make direct contact with the cornea using the probe. What do I have to do during surgery? During surgery, the patient should be as quiet as possible, not talking or coughing. You must keep both eyes open and look at the light from the microscope. You may notice glare, pressure sensation, itching, moisture, and momentary loss of vision. These symptoms are all normal. Postoperative care treatment involves the application of antibiotic eye drops and tapering at intervals for one month. The first few days you should avoid heavy exercise efforts, but you can watch TV and read. You cannot dye your hair for as long as a month. You can shower after 24 hours. Do I need timeoff work? When I can work? This depends on the type of work and potencial exposure to a dirty environment. Most patients can return to work in a week. You are entitled to sick leave for that period, even if there are no complications. Cataract surgery currently has a high rate of success and patient satisfaction. Vision is restored to levels prior to the development of the cataract, and you can even improve on refractive aspects such as astigmatism, myopia or hyperopia. Failure to improve vision can be due to damage caused by other diseases such as glaucoma, macular degeneration, retinal detachment etc. But even in these serious diseases, cataract surgery can offer a benefit as it allows more light to pass through.